How much plastic, tape, wood and foil does it take to create a small, raft-like device that will support over seven and a half pounds of weight? A couple Hereford students could tell you, but then they’d be revealing their secret to success. 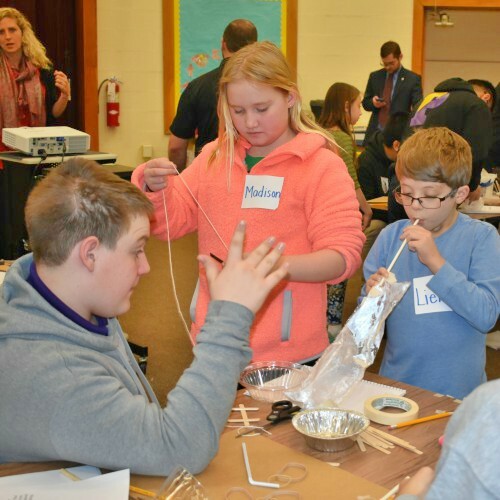 On the morning of February 15, students from Ms. Stanek’s 4th grade class teamed up with 8th graders from the Perkiomen School for the 2nd Annual Innovation Challenge. During the challenge, teams comprised of students from each school tackled a buoyancy challenge utilizing design thinking, a creative problem-solving process. The teams created a small raft-like device using provided materials, tested their design and ultimately competed against their classmates to see which device would hold the most weight. In the end, it was Team 6 (pictured below, left) that emerged victorious. Their device held a whopping 3,470 grams, or roughly 7.65 pounds! While the room was filled with good-natured competition, the opportunity to work with new peers and learn from the design and building process—including successes and failures—was the key to the event. The idea of design thinking and innovation challenges are not new to Hereford. As part of Hereford’s FLITE School (Fundamentals Learned through Innovation, Technology and Exploration), students have the ability to use design thinking throughout the year. This particular annual event allows 4th graders the unique opportunity to connect with and learn from older students from a different school, who they otherwise may not have the opportunity to meet, and it gives the Perkiomen School students an opportunity to practice their leadership skills.